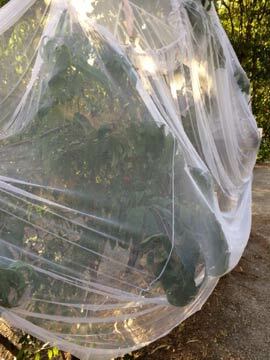 Bird Netting is used extensively in the horticultural industry to provide protection to valuable crops. It is widely used to prevent damage to fruiting crops, stone fruit, soft fruit, berries and pomme fruit. Coming in different meshes and weights for different applications, bird netting is used in viticulture, fruit production and other food crop industries. Bird Netting comes in large rolls for commercial application or as cut to length pieces for individual fruit trees and smaller orchards. Larger rolls are used in commercial applications where large areas such as apple orchards are totally covered. Large rolls are also use to cover animal enclosures and some home vegetable gardens. This is a heavier type designed for more permanent covering of larger structures. Available in widths up to 15m to suit structural use. Useful for home gardeners, lighter weight for easy use. The simple ‘throw over the tree’ method is available in a number of colours including black, with white seeming to be the most popular. Larger trees may be covered more easily by using 2 – 3 pieces and clipping together. Look for UV stabilised netting longer lasting properties. For netting used larger structural applications heavier GSM is available in rolls to 15m wide. Post caps to prevent material being worn or cut on rough surfaces. Clips to allow nets to be secured around irregular shapes. Repair or lacing cord to join netting or repair damaged nets. Retail and wholesale sales of pond and dam liners, shadecloth and shadesails, greenhouse films, weed-matting, solar protectors and pool covers.